Tags: Baltimore-architecture, Baltimore-churches, carte-de-visite, Daniel-Reed-Stiltz, Mount-Calvary-Church-Baltimore, Robert-Cary-Long-Jr. 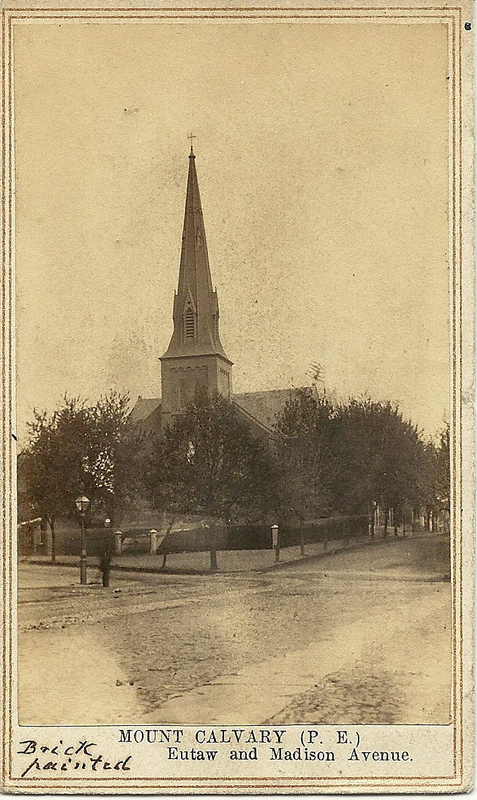 When Daniel Reed Stiltz (1837-1903) took this photograph of Mount Calvary Protestant Episcopal Church in 1864 (as it was called then), the church still had its steeple, bringing the height of the structure to 145 feet. A photo on the church’s website, bottom row, center, in their “oldies” gallery, shows the steeple toppled in a blizzard on March 1, 1914, and while the bell remains, the steeple was never replaced. Robert Cary Long Jr. (1810-1849), creator of the gates of Green Mount Cemetery and the Patapsco Female Institute among many other public and private buildings, designed the gothic revival Mount Calvary Church in 1844-1845. Bishop Whittingham laid the corner stone for the new church on September 10, 1844 (Baltimore Sun, 10 September 1844, p. 2). The church was originally Episcopal, but long deplored for its “Romish” ways. Yet it had a prosperous and distinguished following. Robert E. Lee is said to have worshiped there while living in Baltimore with his family. The congregation finally voted to join the Roman Catholic Church in 2010 and in 2012 was admitted as a “Roman Catholic parish of the Personal Ordinariate of the Chair of St. Peter,” a special dispensation for Amercian Anglican churches by Pope Benedict XVI. Mount Calvary was also controversial for the missions its clergy undertook to Baltimore’s African-Americans. Most identified with this outreach were Anglo-Irish immigrant Reverend Joseph Richey (1843-1877) rector of Mount Calvary from 1872 until his death, and his assistant, Reverend Calbraith Bourn Perry (1846-1914). In 1884 Perry published an account of the work, Twelve Years Among the Colored People: A Record of the Work of Mount Calvary, Chapel of St. Mary the Virgin, Baltimore. This photograph is one of four Stiltz architectural cartes de visite I own that I believe were part of a larger series he issued in 1864, the date of copyright on the back. Stiltz marketed himself as a “view photographer.” His office was upstairs at Butler, Perrigo & Way’s, 163 W. Baltimore Street. The comments written on the bottom margin of these cartes refer to architectural details, so it’s possible these photographs belonged to an architect or builder who kept them for reference purposes. The church is relatively small and unprepossessing from the outside, but the interior is quite beautiful, as shown in these photos taken by Stephen Schnurr. Because Stiltz photographed the church from ground level, when surrounding trees were in full leaf, the exterior is not as clear as in the photo shot from above (in the church’s online “oldies” gallery), probably from the same period. According to an admiring Baltimore Sun description of the church’s design, published 19 February 1846, all of the interior details were designed by Long himself. The stained glass was supervised by “Mr. Stephenson, superintendent of the glass-staining at Trinity Church, New York.” The height of the interior was enhanced by the use of an exposed beam structure; the pulpit, desk, and chancel railing are, said the writer, “all of solid walnut;” originally, it seems, the ceiling was painted a dark walnut hue to match the furnishings. The effect seems to have been particularly striking. “The whole effect of the dark roof and pews and the tinted atmosphere thrown in by the colored glass is so different from what we have been accustomed to see in our modern churches that it takes some little time for the eye to grow familiar with the intention of the architect. But the longer we remain on the premises the more imposing and satisfactory is the effect produced” (Baltimore Sun, 19 February 1846). The artisans who created the church’s beautiful decorations, including its chancel altarpiece, Christ the King side altar and the Our Lady’s Shrine, are not mentioned. Retired architect Jim Wollon, a member of the Baltimore Architecture Foundation who worked for the church on ADA improvements some years ago, had a chance to explore the building and its history quite thoroughly. The Niernsee & Neilson chancel and window can be seen on the bottom row, far left, of the “oldies” photo gallery on the church’s website. In 1849, Long’s already brilliant but short career was cut off prematurely when he died suddenly of cholera while visiting Morristown, New Jersey. Although it has not been confirmed that Long is buried there, there is a stone erected in Long’s memory in the cemetery of Morristown Presbyterian Church, Morristown, New Jersey. View a digitized version of a complete Minton Tiles catalog. Learn more about the work of the Baltimore Architecture Foundation. Special thanks to Jim Wollon for his enthusiastic help with details about the Mount Calvary Church’s architecture and interior design history.